I found a recipe for a Thai chickpea and vegetable pizza from Veggies Don’t Bite while scrolling through Pinterest last night. I’ve had Thai chicken pizza before, and I knew that it could turn it out as a vegetarian dish. Instead of making the peanut sauce the recipe calls for, we went to Trader Joe’s and settled on their Satay Peanut Sauce. My boyfriend and I also decided to sprinkle the pizza with Parmesan cheese before putting it into the oven. The outcome? Delicious. 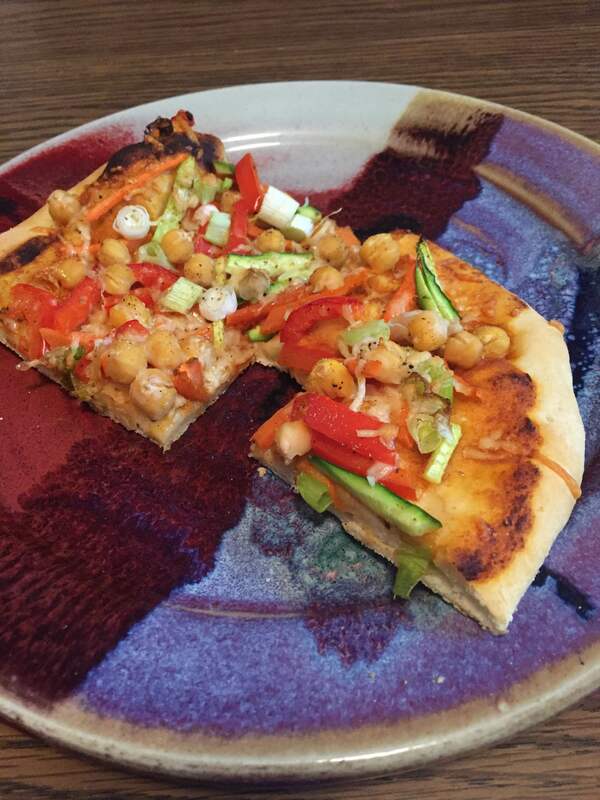 I loved the chickpeas as a topping and think I’ll try adding them onto my normal vegetarian pizzas every now and then. The only change we’d make for the next go around would be to add more of that delicious peanut sauce. If you’re bored with your pizza night, try this recipe. It was fantastic!